Note: Only users with Admin permissions can add new users, modify user permissions, or delete users in CodeSignal. Step 1. Go to your profile drop-down and select Manage Accounts. Remember, you must have an Admin account to do this! Step 2. Click on INVITE A COLLEAGUE. Step 3. Enter your colleague's name and email address (lowercase letters only) into the modal, then click SEND AN INVITE. Step 4. The user whom you've invited will receive an email with their log in information. All they need to do is click the button in the email and log in, then they'll be ready to start hiring awesome candidates! Step 5. (Optional) By default, all new users have a user type of Manager. If you need to change your new user's permissions, click the drop-down menu that says Manager and select Admin instead. 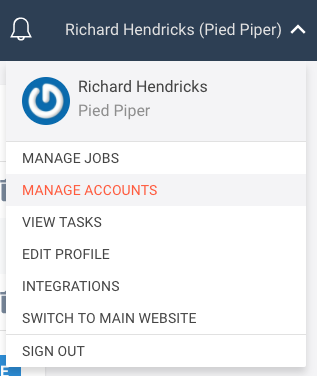 To edit which jobs a user is assigned to, click on the Edit icon next to their name. Select the jobs that you want to assign the user to, then click SAVE. To delete one of your company's user accounts, click the Delete icon next to their name. You will be asked to confirm this deletion.